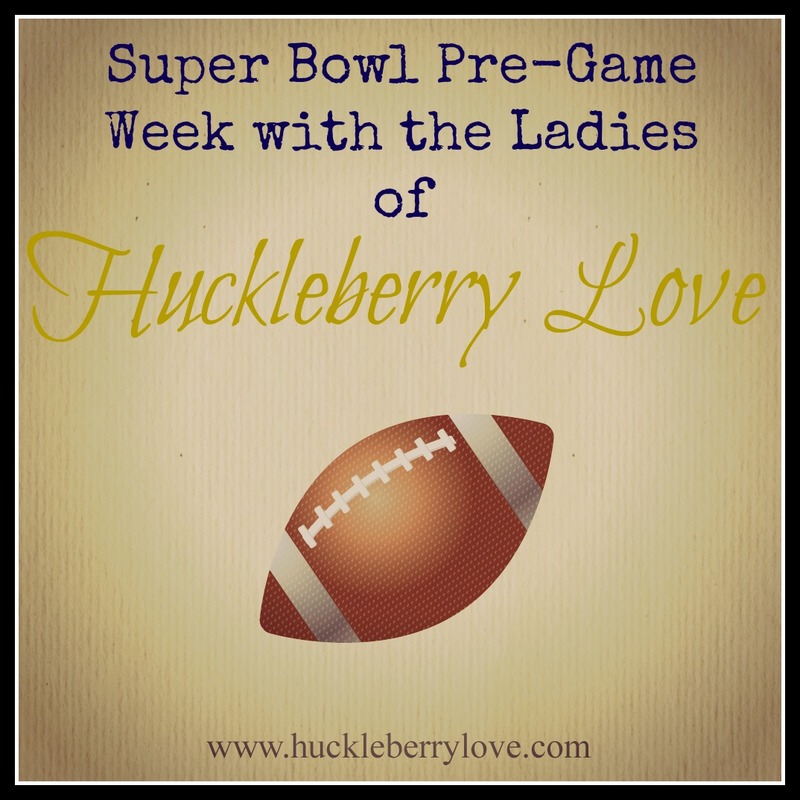 Welcome to the last day of Super Bowl Pre-Game Week here at Huckleberry Love where we have celebrated our love for the game all week long! 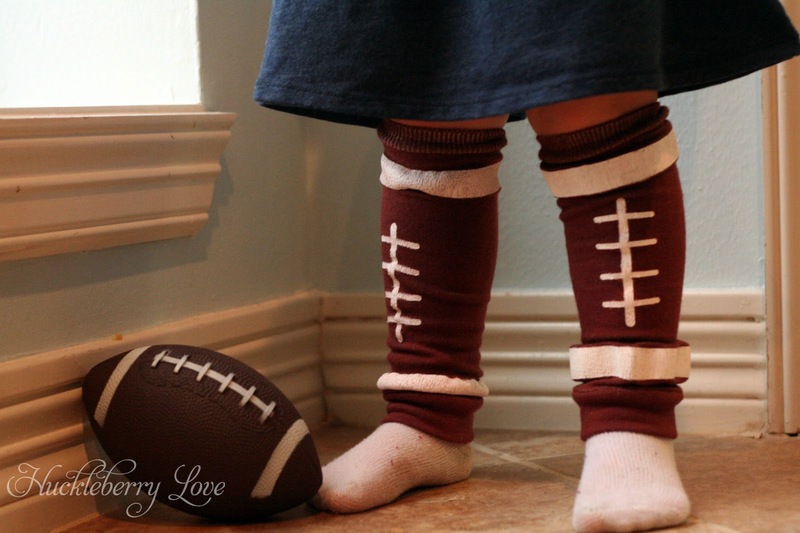 There are many reasons to look forward to the big game this weekend: a spectacular display of athletic prowess by both teams, delicious dips and foods in a dizzying spread, clever commercials, and of course, decking your kids out in the cutest football gear possible. 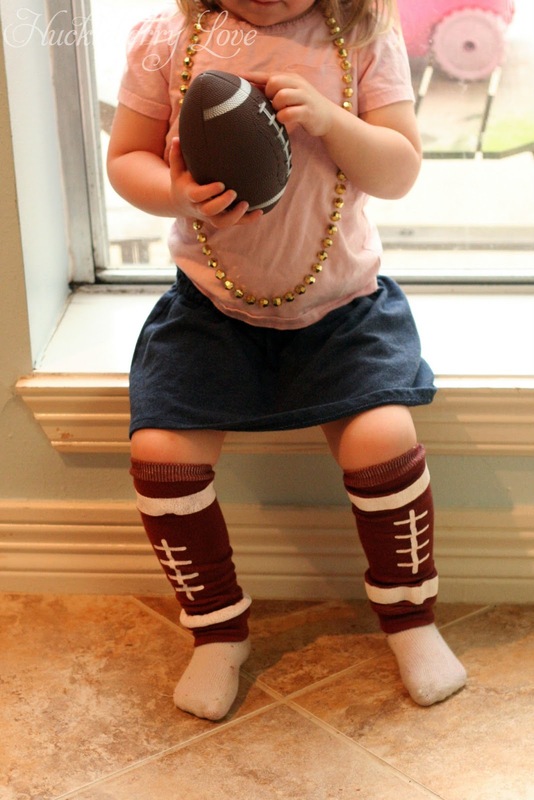 I can never get enough of seeing little babies and toddlers running around in football jerseys. The cuteness factor kills me every time. But since our team didn't make it to the Super Bowl this year (there's always next year, boys!) 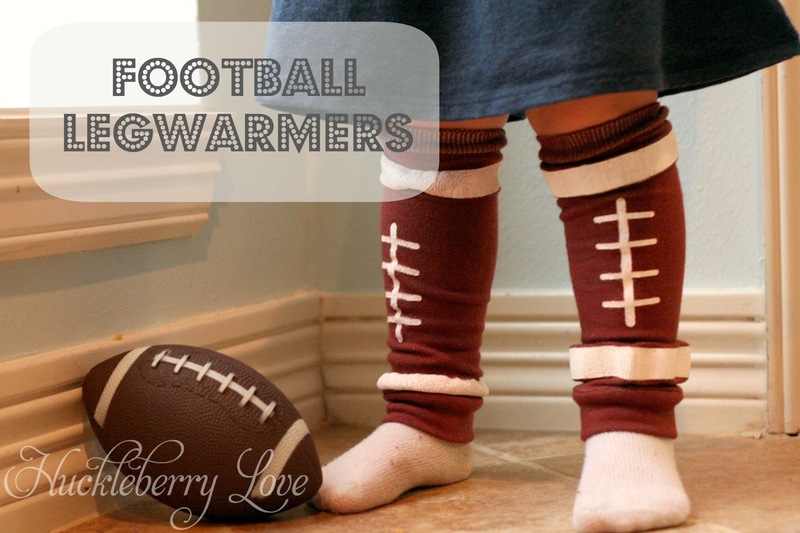 and we don't own any other team jerseys, I decided to make these adorable football leg warmers for my daughter to wear. They are also really simple to make and cute on either a little girl or boy. And how cute would these be as a baby shower gift? 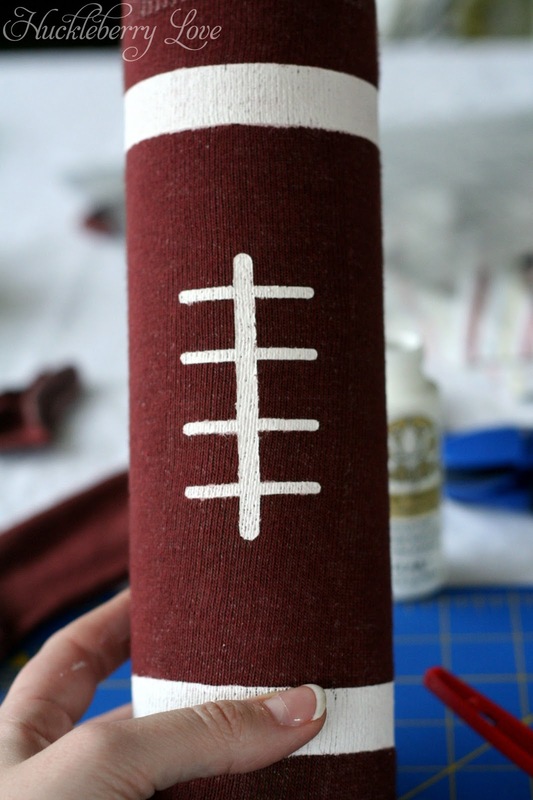 So bust out your fabric paint and let's get going! 1. 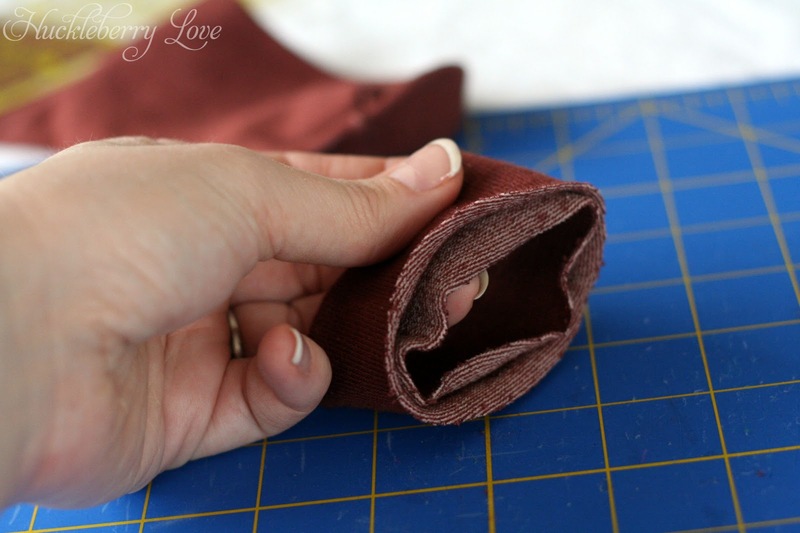 If you bought brown socks, you can skip down to step 3. However, if you bought white socks, it's time to dye them! I was able to find white cotton knee-high socks at Wal-Mart. The $2 knee-high socks sold at Target are polyester (at least, all the ones at my store) and I found out the long and hard way that polyester does not dye well. 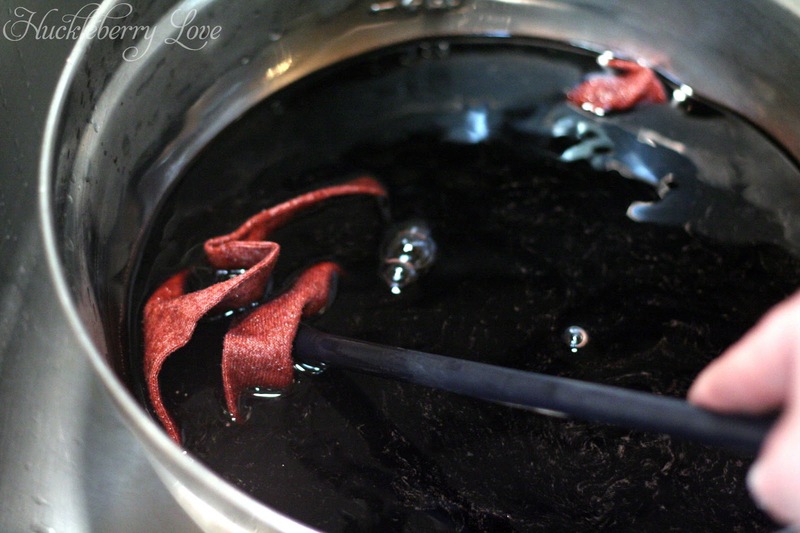 The left sock is the polyester sock after a full night in the dye bath. 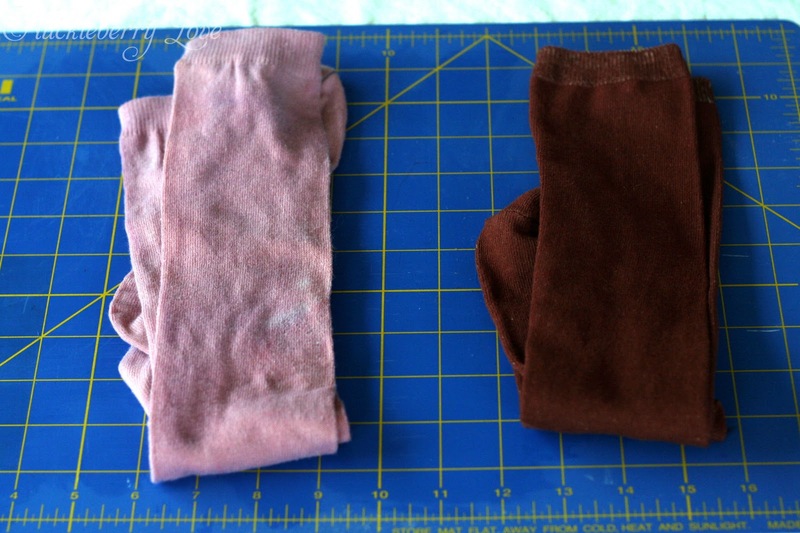 The right sock is the cotton sock after only 30 minutes in the dye. I think I really hate polyester now. 2. After you have dyed your socks, rinse them, wash them, and dry them. 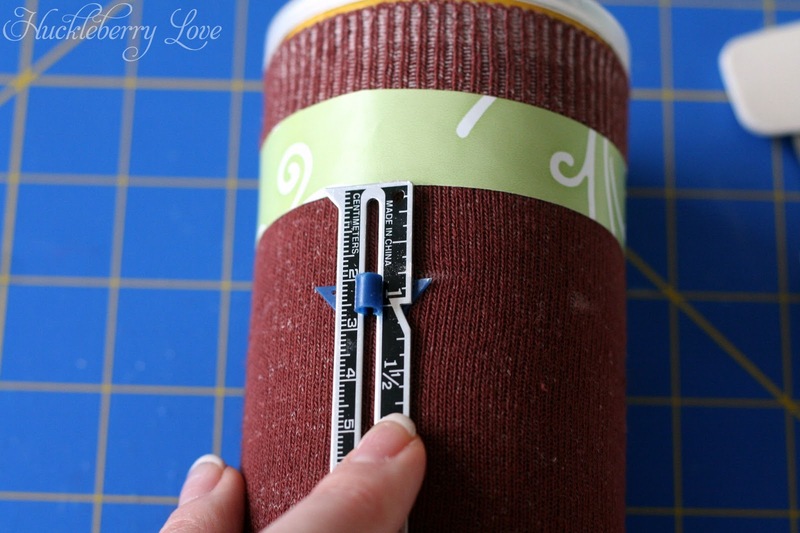 Now we can begin making the legwarmers! 3. 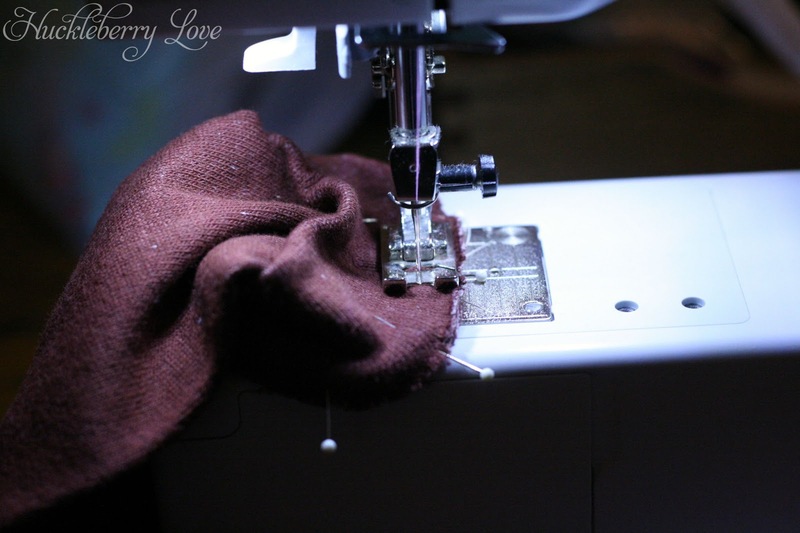 Lay your sock out and draw then cut a straight line right across the ankle section, so the foot portion is removed. 4. 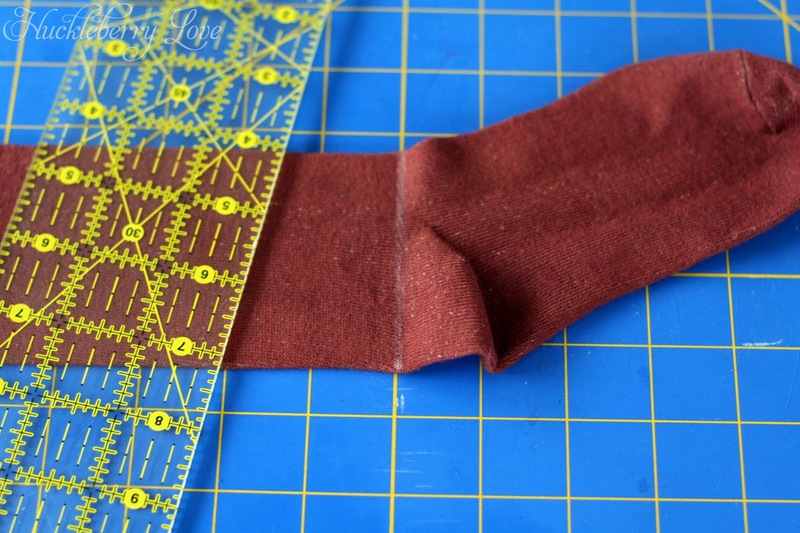 Take the foot section and cut it straight across the toe and straight across the heel, so you are left with a rectangle. 5. 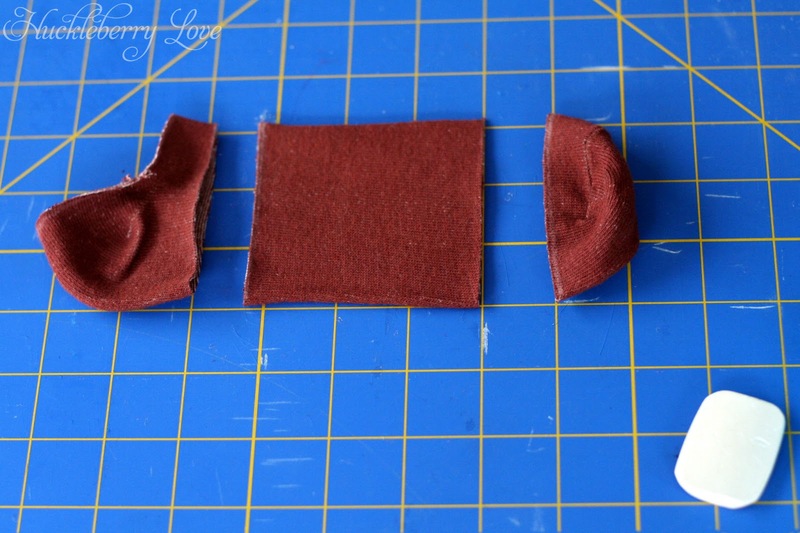 Take this smaller piece and fold it in half, right sides facing out. 6. 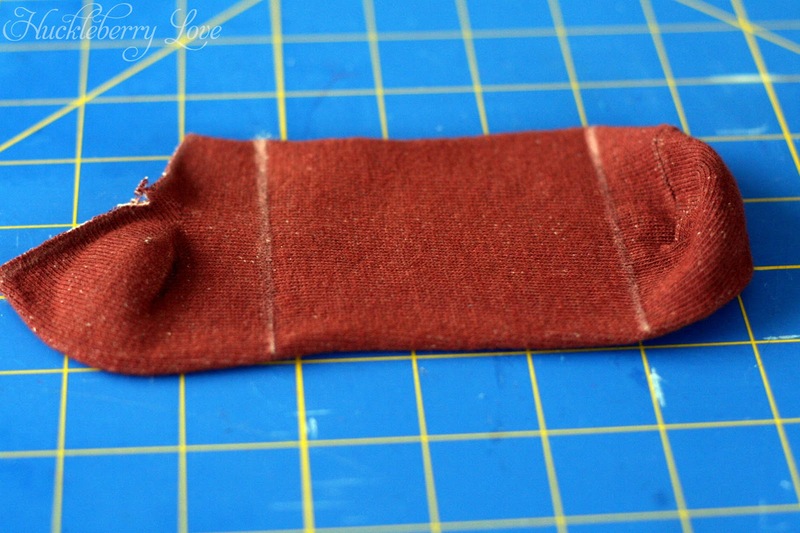 Slide the smaller piece down over the cut edge of the sock and line up the raw edges. Pin. 7. Sew along the edge about 1/4" away from the raw edge. Turn right side out. 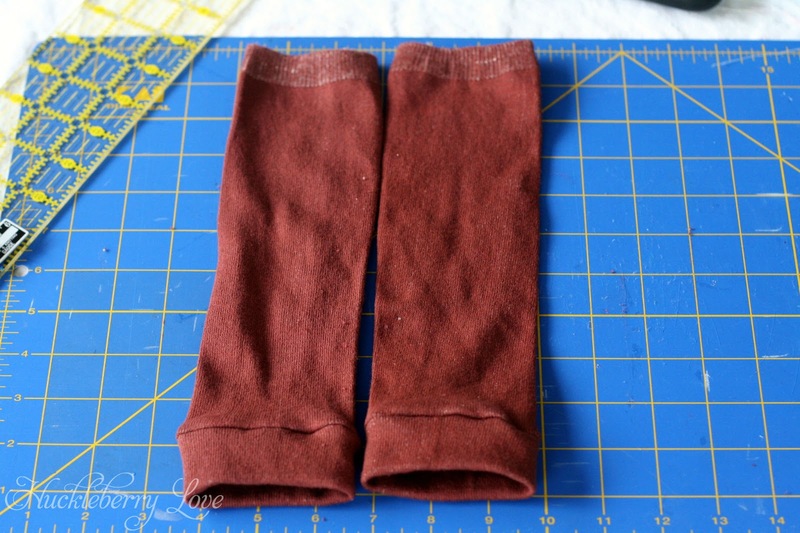 Now you have brown legwarmers! 8. 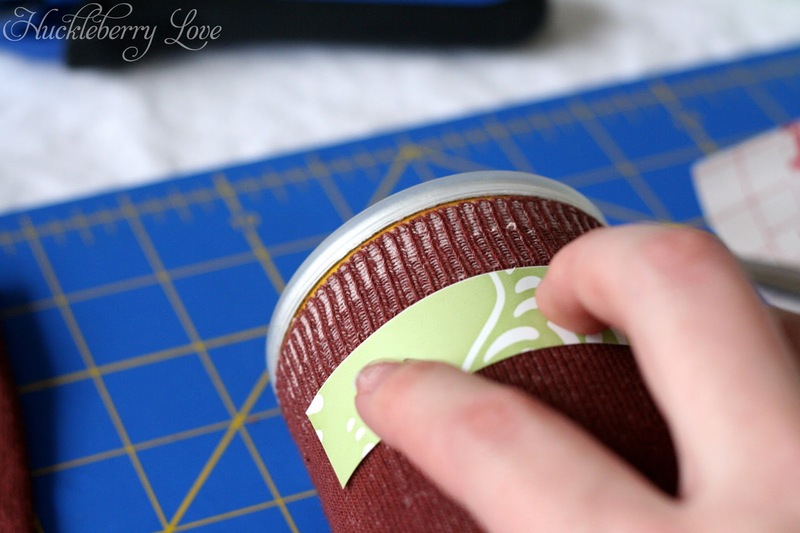 Slip the legwarmer over the Pringles canister. This will help maintain the shape while you are painting. Also, if you get hungry while you are crafting, the chips will help with that as well. 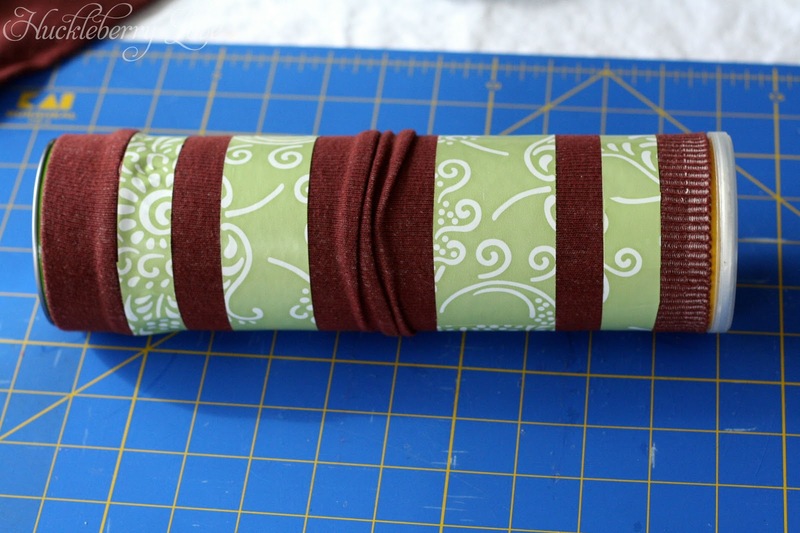 9.Cut a 3/4" inch strip of contact paper long enough to wrap around the legwarmer. Follow the line of the ribbing along the upper part of the legwarmer and stick down your contact paper. 10. Measure 3/4" down from the top strip, mark and adhere another strip of contact paper. 11. 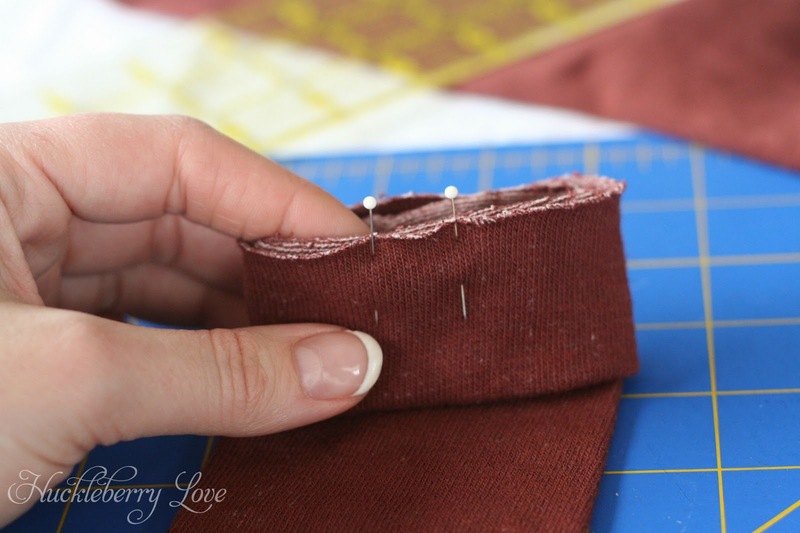 Do the same for the bottom stripe, starting from the seam. 12. Paint your stripes! I like to use a foam brush with a light coat of paint and do multiple coats. 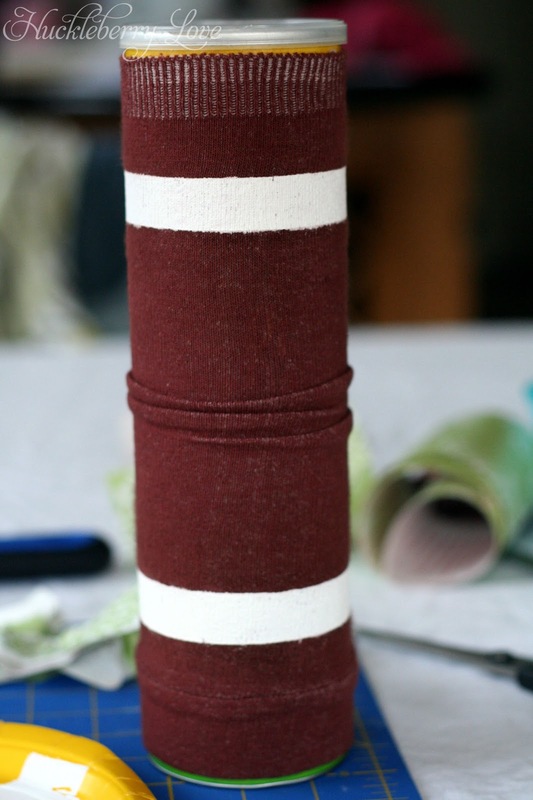 Since the sock is such a dark color, I had to really layer on the paint to keep the brown from showing through. I think this also happened because I didn't use very thick paint. 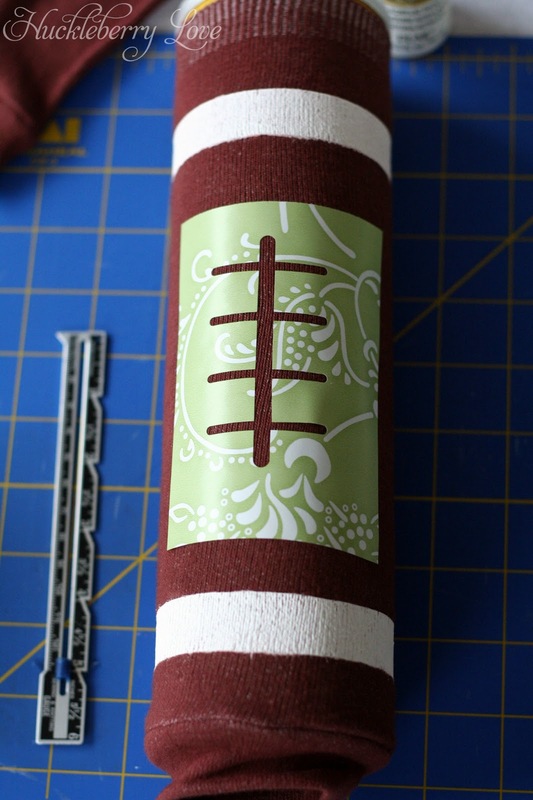 So, learn from my mistake and use nice, thick fabric paint! After the paint has dried, remove the contact paper. 13. If you have a silhouette, draw a line about 3 inches long with a line thickness of 15. Draw another line perpendicular to the first and about 1.5 inches long with a line thickness of 8.5. Replicate the perpendicular line three times and space them evenly along the 3 inch line. Select all and open the cut style window. Choose cut edge. 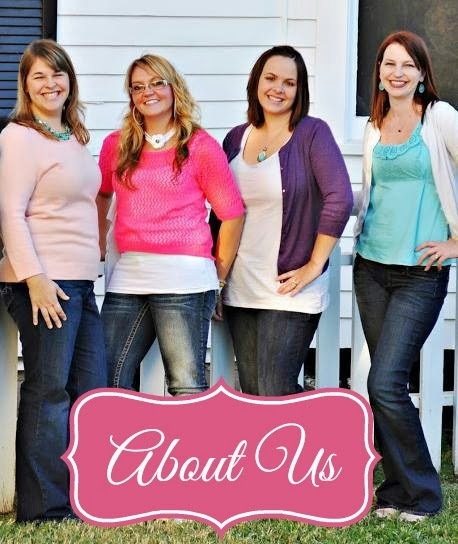 Send to your silhouette and cut out 2. 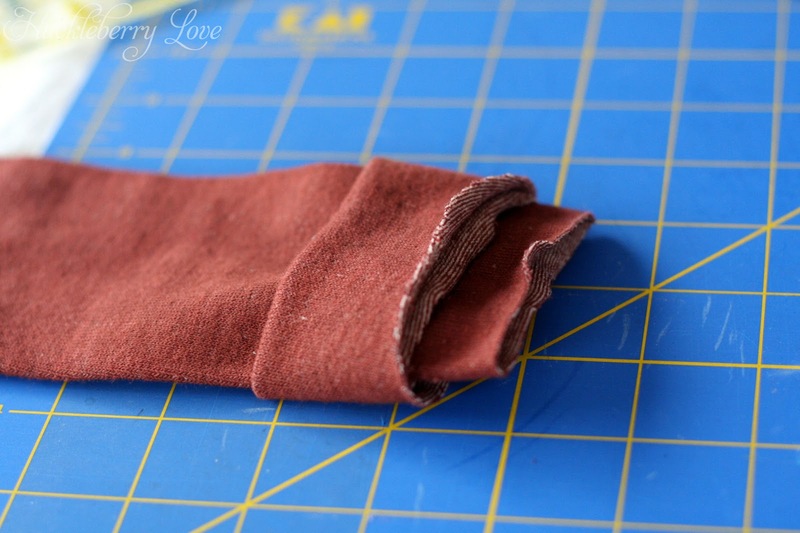 Once you have your stitches cut out, find the middle of your sock and slap it on there. 14. Paint and then remove. 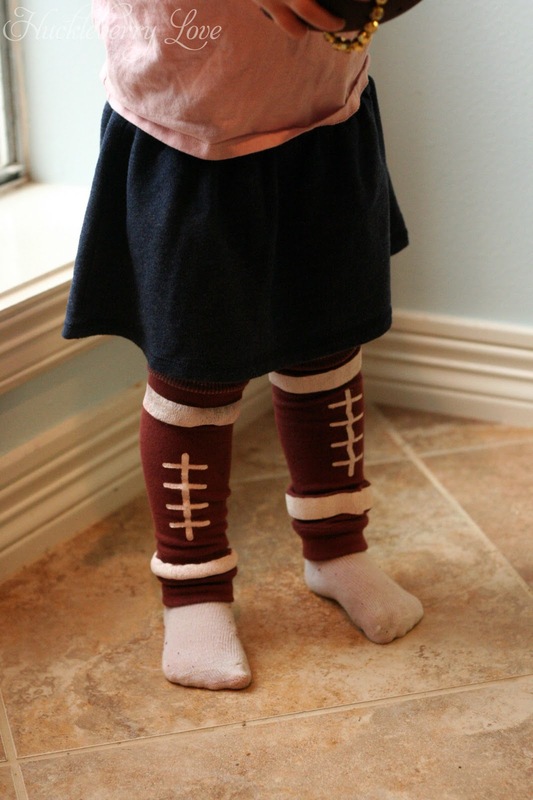 These little legwarmers look so cute under a skirt. 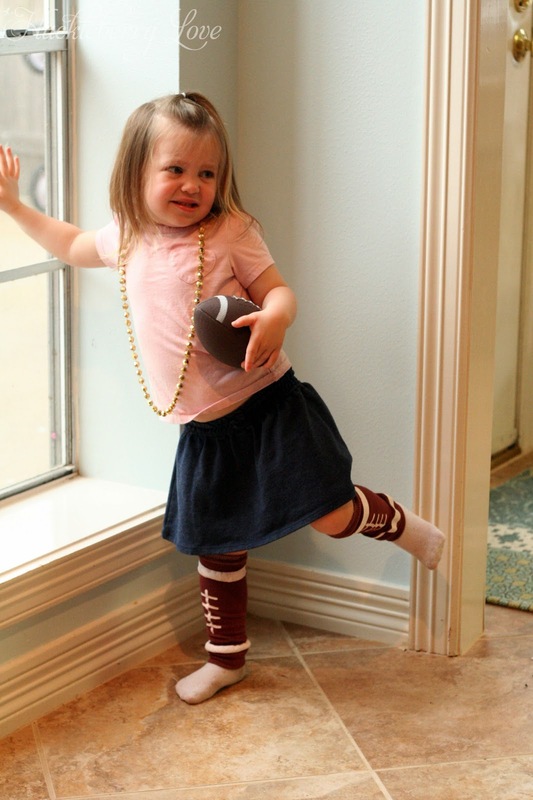 This my daughter's Heisman pose. Not exactly perfect, but we have a few years to work on it. 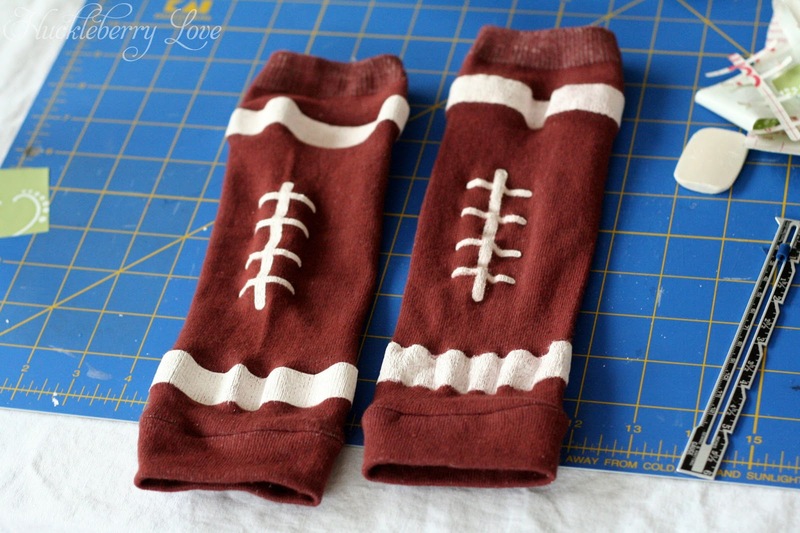 Now your little football lover is ready for the big game! We hope you guys have enjoyed this week of football themed posts. Have a great time watching the Super Bowl and may your team win! Super cute - I'm going to feature these in a round up next week.